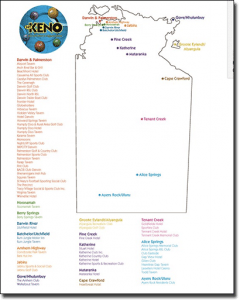 If you’re a fan of land-based keno, then the Northern Territory is the place to play it. NT Keno is run by SKYCITY Darwin (the only casino in Darwin) and you can find it in over 70 venues in the Northern Territory. What’s more, NT Keno is the only operator to host live ball keno instead of using random number generator software, which is perhaps why you might be more inclined to play at a land-based venue than online. However, if you can’t make it to the Northern Territory then we recommend heading to our secure keno sites online to play fair RNG keno. NT Keno is simple to play. Simply head to a venue which hosts the game and pick up a form to fill out. There are a total of 80 numbers and players can choose from one to 10, 15, 20, or a maximum of 40 numbers you think will be drawn for the standard games. To determine your choices put an ‘x’ through each ‘spot’ (number) and then pick how many games you want to play and how much you wish to wager on each game. If you can’t pick the numbers yourself, you can opt for QuickPick where the numbers will be randomly selected for you. The minimum amount you can play for one game is $1, irrespective of the amount of numbers you choose. Once you have the form filled out you need to hand it into the keno operator or bar attendant who will put your numbers through and you then simply wait for the results. The numbers are drawn live by a human dealer instead of RNG software determining the results. This is why many people love NT Keno, even though RNG software is incredibly fair when opting for reputable software providers, such as the many we recommend for online keno. There’s also Jackpot Games, where a total prize pool continues to grow until it is won. Here, players pick six (jackpot starts at $1225), seven (jackpot starts at $5100), eight (jackpot starts at $15,000), nine (jackpot starts at $100,000), or 10 (jackpot starts at $1,000,000) spot jackpot games. This is compared to the maximum payout possible of $200,000 for the standard games – with the number of spots you’ve picked and gotten correct and how much you have wagered determining your payout. Superplays: Players can opt for automated numbers, similarly to QuickPick, but with more ways to win. There are 10 Superplay options to pick from with the maximum costing $15 where you get 15 chances to win all spots from one to 10 on the one ticket, including all jackpot games too. Visit the SKYCITY Casino website for more information on Superplays. Heads or Tails: You can also play Heads or Tails, which is generally located on the back of the form or on a separate form – or you can tell your operator too. You simply pick whether 11 or more numbers will be drawn in the top half for Heads, or 11 or more numbers will be drawn in the bottom half for Tails. You can also opt for Even, where 10 numbers are evenly drawn in the top and bottom grid. The maximum bet per game is $500 for Heads or Tails. Unfortunately, you can’t get results online or watch NT Keno live on your device like you can for keno in NSW and QLD, so you will need to get your ticket checked by an operator to find out if you’ve won or not if you aren’t watching at a participating venue. While NT Keno does have the edge of being drawn live, you may not be able to make it to a venue. Fortunately there’s the option to play live dealer keno online, at one of our favourite online casinos www.GdayCasino.com. Powered by Ezugi, players can pick their numbers via the electronic layout, while a human dealer draws the numbers from a ball barrel. There are also a number of standard RNG keno titles available here too.